A Christmas holiday got off to a great start for Ms Emma Poff from Malahide, Dublin, who was announced as ASL Airlines Ireland ‘One Millionth Passenger’. Emma had checked in with her family for her holiday flying with ASL Airlines Ireland who were operating the charter flight from Dublin to Salzburg. Suddenly, ASL Airlines cabin crew unfurled a 1,000,000th passenger congratulatory banner. As Emma’s name was announced there was a spontaneous cheer and applause from all of her fellow passengers at Gate 210 in Dublin Airport. 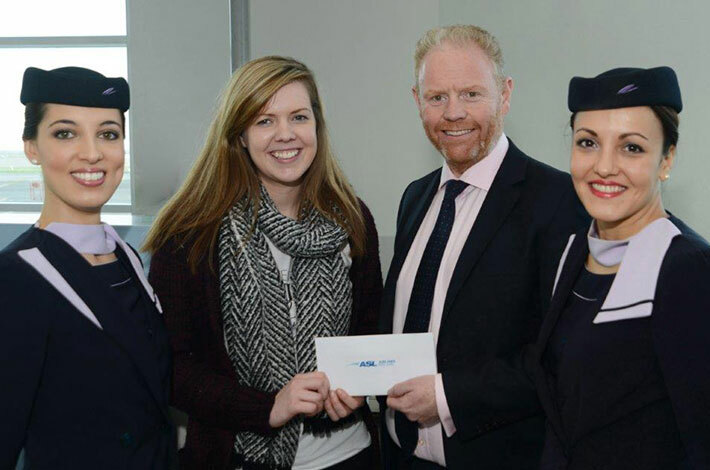 For being the one millionth passenger to book an ASL Airlines flight the Irish airline’s Chief Operating Officer, John Rawl presented Emma with a €1,000 Crystal holiday voucher so that she can come back and fly with us again next year. It was on this celebratory note that ASLI ended the year and look forward to making a start on our next million in 2016!